Following three centuries under the rule of Portugal, Brazil became an independent nation in 1822 and a republic in 1889. By far the largest and most populous country in South America, Brazil overcame more than half a century of military intervention in the governance of the country when in 1985 the military regime peacefully ceded power to civilian rulers. 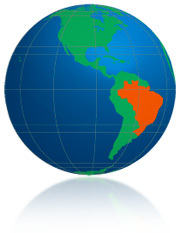 Brazil continues to pursue industrial and agricultural growth and development of its interior. Exploiting vast natural resources and a large labor pool, it is today South America's leading economic power and a regional leader. Portuguese is the only official language of Brazil. It is spoken by nearly the entire population and is virtually the only language used in schools, newspapers, radio, TV and for all business and administrative purposes. 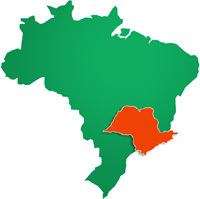 Moreover, Brazil is the only Portuguese-speaking nation in, making the language an important part of Brazilian national identity, giving it a national culture distinct from its Spanish-speaking neighbors. Due to this, the language is somewhat different from that spoken in Portugal and other Portuguese-speaking countries, mainly for phonological and orthographic differences, similar to the difference between American English and British English. There are important communities of speakers of German (mostly the Hunsrückisch, part of the High German languages) and Italian (mostly the Italian dialect, of Venetian origin) in the south of the country, both largely influenced by the Portuguese language. 519.000 / other (Arab and Amerindian). GDP 1.838 Trillion in 2007 (growth 4,5% IN 2007) Economy number 8h in the world. The nonspecific term "Grande São Paulo" ("Greater São Paulo") denotes any of São Paulo's metropolitan area definitions. The legally defined Região Metropolitana São Paulo consists of 39 municipalities in total, and a population of more than 20 million inhabitants. As in all of Brazil, people of different ethnicities mix with each other, producing a multi-ethnic society. Today, people of 100 different ethnicities make São Paulo their home. 30.000 taxis (Cab) in the city.